The SAT is coming up on June 7. Chances are that if you’re taking it at this point, you’re probably taking it for the first time. It can be a daunting thing, particularly one of the more frightening sections — the essay. Not to fret! Today we’re here to talk about how to plan and prepare for writing a sock-blowing-off essay. When you’re preparing to take the SAT essay, you obviously won’t know exactly what question you’re going to have to deal with. So you can’t focus on learning about specific subject matters to prepare yourself. Instead, you need to focus on structure and general writing technique — those are the things that will take you to a stunning essay. “You have twenty-five minutes to write an essay on the topic assigned below. “Think carefully about the issue presented in the following excerpt and the assignment below. You’ve got 25 minutes only for this thing, so developing a thesis isn’t exactly like it would be on any other essay. We’re not talking about coming up with a complicated yet insightful take on a deep and problematic issue — we’re talking about coming up with a clearly stated position on the question asked of you, and putting it right up front, at the top of your essay. So, here — “Do memories hinder or help people in their effort to learn from the past and succeed in the present?” The question clearly sets up two positions, that “Memories hinder,” or “Memories help.” Pick one — you’re already most of the way to developing your thesis! Don’t pick one at random, either. Pick one that snags you, or feels right, or immediately invokes support and arguments in your head. Here’s the next part to developing your thesis: say why that position is true. Quickly, clearly, and simply. “Memories hinder people in their effort to learn from the past and succeed in the present because their dwelling upon memories leads to a lack of focus in and upon the present.” “Memories help people in their effort to learn from the past and succeed in the present because they inform people of prior mistakes and prior successes and provide guidelines on how to avoid those mistakes and replicate those successes.” Or whatever might float your boat. You might not want to use the same exact language as the original question, the way that the two above examples do. It’s better to rephrase things in your own words. But again, you have 25 minutes, and you do what you have to. If you can’t figure out how to rephrase it in your own words, then just reflect the original language. How to prepare yourself for this: Find some example SAT essay questions, or generate some yourself, and rapidly try to come up with solid thesis statements phrased in your own words. We’ve got a thesis, and that means we’ve got an argument! Great! Now we’ve got to figure out how to support it. This is essentially just a brainstorming process, but your objective is to come up with some good examples that you can use in the body of your essay. If you can refer to actual stories or quotes or other works, then all the better — but make darn sure they actually relate to the point you’re trying to make in your thesis. So for this essay question, let’s say you’re arguing that memories hinder people because they make people get so bogged down in the past. What’s some support you can pick out for this? Well, it’s a dark example, but how about Macbeth? It’s a quintessential example of guilt weighing people down, and what is guilt but the weight of past memory upon your current self? Is the example perfect? No. Does it relate usefully enough for the 25 minute time period you have to write this essay? Yes. How to prepare yourself for this: Take some of those thesis statements you generated before, and give yourself a couple minutes to come up with a few supporting examples. Focus on both ideas, and actual evidence that embodies those ideas. Now, we have a thesis and some examples. Time to put them together! Sketch out a quick structure using your thesis and examples to figure out what your essay is going to look like. The quintessential structure you should be aping is the five paragraph structure. You have your intro paragraph, and you have some supporting evidence that you can put into your body paragraphs. You’re going to want three body paragraphs, because it’s a solid amount of evidence without being too much for your 25 minute time frame. Quickly chart out how to split up your evidence into three body paragraphs. For each of those three body paragraphs, you should make a topic sentence. Make it much the same way as your thesis. Choose what that paragraph is arguing, and then say why that is true. So for your first body paragraph, you might want to argue that a risk of not repressing memory is to become bogged down in guilt and regret, using the Macbeth example. Your topic sentence, then, might be: “If one fails to repress his or her memories well enough, then those memories might hinder his or her future progress by producing feelings of regret and guilt which prevent action in the present.” So, the topic sentence is arguing that not repressing memories leads to the inability to act in the present, because those memories can cause regret or guilt. Again, is it perfect? Not by a long shot. But you’ve got 25 minutes — perfect isn’t the goal. Solid and workable is the goal. Make sure when you’re coming up with your topic sentences that you aren’t repeating yourself, either. They should fit together so that they build on top of one another while supporting your overall thesis. How to prepare yourself for this: Come up with three topic sentences for each of your thesis/evidence combinations from the prior exercises. See if you can read the topic sentences one after another to get the very basic outline of the argument. If you can’t, try to rework the topic sentences until you can. You’ve got your thesis, your evidence, your structure, and now you’ve got to spend the time you have left writing the thing! This should be the step that takes the most time out of your 25 minutes. Fleshing out your intro paragraph to set up your basic argument and points. Fleshing out each of your body paragraphs to fully develop an argument around each topic sentence. Forming transition sentences to carry the reader from paragraph to paragraph. Finishing out the essay with a conclusion that reminds the reader of the key points and wraps the essay up. It sounds like more than it actually is. The key emphasis is to make sure that your overall essay is clear, fleshed out, well-supported, and complete. 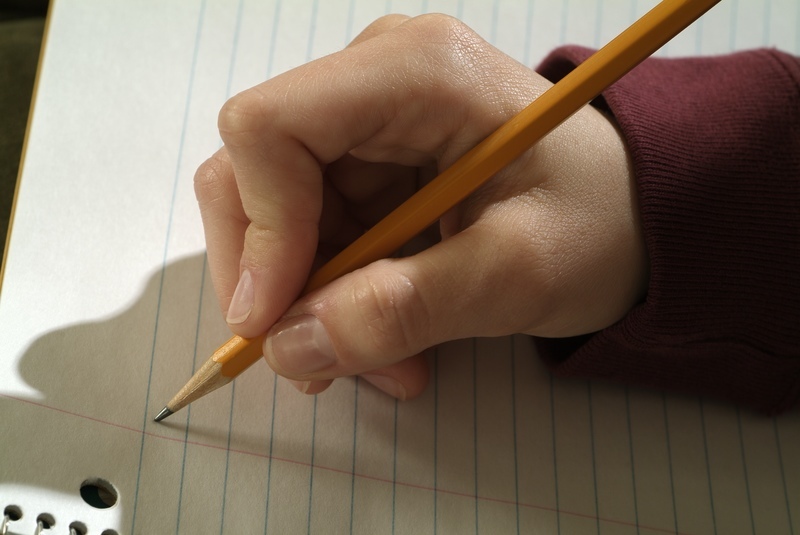 While writing, pay attention to grammar and spelling, word choice, and sentence structure. Your grammar and spelling need to be accurate as much as possible. Varying your word choice is an oft-cited strategy for further improving your essay. And using differing sentence structure similarly signals your competency with writing. How to prepare yourself for this: Give yourself 5 minutes to write a single paragraph based on a topic sentence that you’ve already produced. Then go over the paragraph. Does it support its overall argument? Did you work in the evidence? Does it have correct grammar and spelling, good word usage, and varied sentence structure? Try revising it, or try again with a new topic sentence to get better on those vectors. This one isn’t a necessary step, but if you have some time at the end of your 25 minute essay writing period, it’s worth keeping in mind. Read over your essay. Look for spelling errors, grammatical mistakes, or places where your handwriting might be illegible, and fix them up wherever possible. If you see any egregious errors, make sure you fix them, too. Since you only have 25 minutes and your essay is entirely handwritten, you can’t really do any kind of significant or substantial edits. But it’s still worth your time to spend a few minutes reading it over, just to catch any of the issues that might lead to penalties when the essay is being graded. How to prepare yourself for this: This is much the same process as you did to prepare yourself for writing the full essay. Take some of the paragraphs you’ve previously written and check them over. But to make sure you can do it in the context of the test, only give yourself a couple minutes to read it over and make changes. Try to speed up your read through without glossing over mistakes.